Every so often, you need a win. You know what I mean: just when you feel like the elements and the elected are conspiring against you, by some stroke of luck and timing you actually get it right and have an uncontested success. That’s what a sorghum-sudangrass mix was for us last summer. We were very fortunate, because we had bet big on it by planting about 250 acres of the stuff. It rewarded us by yielding incredibly well, giving us some good grazing and a bunch of feed for the winter. Sorghum-sudan wasn’t all we planted in these fields. In our part of the country we’ve learned not to put all of our eggs in a warm season annual basket. Too often we get cool, wet weather that causes the sorghum-sudangrass to stall out. That is why we also planted Italian ryegrass and berseem, balansa, crimson and red clovers with the sorghum-sudan. We had a very dry summer without much rain from when we planted the mix at the end of May and on through the end of August. The other species survived but didn’t really produce until late summer. Still, they have value. They give us protection from a cool summer, they grow later into the fall, and the clovers provide nitrogen for the next crop. Yet the sorghum-sudan was the story of last summer. A lot of people think that sorghum-sudan is a 50-50 cross between forage sorghum and sudangrass. But that is not usually the case, as these plants just have some genes from both parents. And while my favorite variety is a hybrid, it only has about as much sorghum in it as my dog has wolf genetics. I am starting to like berseem clover in cocktail mixes. It looks very much like an annual alfalfa, and palatably is as good as newly seeded alfalfa, but with better fiber digestibility. The balansa clover was very slow to establish. Toward fall it started to come on, but we really didn’t get a lot of growth. The crimson is a great nitrogen fixer, but not very productive. We use the red clover to ensure having a clover to overwinter and provide some green in the spring. We waited until the soil warmed up to plant. Last year we planted the first field May 20, and the last one went in around the first of June. Sorghum-sudangrass really likes 60-degree soil at the planting depth. While that’s warmer than corn needs, sorghum-sudan is planted shallower and thus doesn’t have to be planted much later. We planted 20 lbs. of the sorghum-sudan, 10 lbs. of the Italian ryegrass and a total of 8 lbs. of clover. All seed was mixed and planted through the grain box to a depth of about one inch. Calibration is important with a mix this diverse. The only fertilizer used was liquid manure, and for the most part it worked well. Sorghum-sudan is a luxury feeder, so you need to provide about 50 units of nitrogen after each harvest. We applied about 4,000 gallons of manure per harvest and, while that does not provide as much N as the plant would like, it grew well under the organic management. We usually plan on grazing about 40 days after planting and every 25-30 days thereafter. If we are harvesting we can wait another 10 days. It grows very fast. You need to start harvest when it is 30 inches high, because in 10 days it will be five feet tall. Residue is critical if you want regrowth. A minimum of four inches is good, and six inches is better. It is a lot easier to get adequate residue when grazing taller material. We actually chopped the majority of the crop we grew this year. The custom harvester had some issues merging the longer material, but found it worked if he hit the windrows at an angle. We also round-baled and inline-wrapped some acres. Most of our fields yielded about two tons dry matter/acre per harvest, and we got three harvests on our early planted fields. That is as much as most of our corn silage fields normally yield, and more than our perennial hayfields. Because of the dry conditions, the first two cuttings were about 80% sorghum-sudan. The rains returned at the end of August, and the last cutting was likely about 50-50 sorghum-sudan and the other species. The ryegrass and clovers really came on with the moisture and cooler fall temperatures. While it generally won’t out-yield corn silage, the sorghum-sudan mix grown last summer was a winner in terms of quality. I have started to look at pounds of digestible fiber per acre as the most important metric of a forage’s success on my farm. I can replace starch or protein through purchased grains if necessary, but digestible fiber is expensive to haul and hard to find. This cocktail mix excelled in terms of digestible fiber. To calculate digestible fiber, I multiply the amount of Neutral Detergent Fiber (NDF) by the NDFD30 — the amount of that fiber digestible in 30 hours. The cocktail mix averaged about 55% NDF, with an NDFD30 of about 65%. That means that each pound of feed was 35.75% digestible fiber. Each acre produced about 4,000 lbs. of digestible fiber. Compare that to a corn silage sample of 40% NDF and 55% NDFD30. Each pound of corn silage would be only 22% digestible fiber. With comparable yields we would harvest about 2,400 lbs. 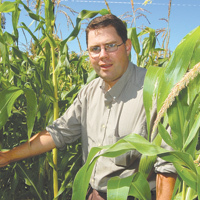 of digestible fiber per acre with the corn silage — substantially less than the sorghum-sudan mix. Alfalfa would come to less than a ton of digestible fiber per acre. Of course there isn’t starch in this mix, but our sugar levels ranged from 10-18%. The combination of sugar and digestible fiber gave us energy levels comparable to corn silage, with protein substantially higher in a range of 10-14%. Prussic acid is an issue for sorghum-sudan in the fall, so we pulled the grazing animals off prior to the first frost. We harvested a bunch of the fields after the frost, but delayed feeding the material because it needs a thorough fermentation to dissipate the acid. In an immature state this mix could account for 100% of a dairy animal’s daily forage needs, and on our conventional dairy this is the only forage we are feeding. When we switched from an alfalfa/corn silage diet our intakes declined about 15% due to the increased fiber levels. Generally, you would view that as a negative, but animal performance actually increased. In early December we were shipping about 100 lbs./cow of fat-corrected milk with only 48 lbs. dry matter intake and a really low daily feed cost per cow. Of that 48 lbs., 18 lbs. is a grain mix of corn and soy, while the remainder is this forage. We grazed organic dairy cows on the mix for part of the summer, but the majority was grazed by heifers and dry cows. Because it matures so fast, it can be difficult to build a grazing wedge and maintain milk production. On the organic farm, we are feeding the mix as baleage to our bred heifers and dry cows. This feed was made from pastures that got away from us. Though not great dairy feed, it is a nearly complete dry cow and heifer forage, and these animals do really well on it. In summary, our increasingly erratic weather patterns make diverse annual mixes more important than ever. By combining cool and warm season annuals, we are able to extend our growing season while increasing our chances of summer success. While the individual species performance will change with each crop and each year, with such a mix we should always have some high-quality forages available to feed our animals. 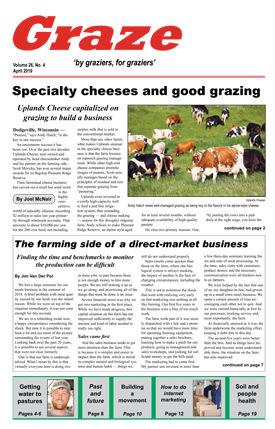 Daniel Olson milks cows, sells seeds and direct markets from his farm near Lena, Wisconsin.